Several of the stories in the book deal with a society where robots, cyborgs, androids and machines have been made slaves. We are told stories both about societies where the technological development perhaps went too far and where the machines take over, or societies that find themselves suddenly without technology. In a few of the stories, the machines riot and even go to war against the humans, sometimes they win, sometimes they don’t. In ‘To Preserve Humankind’ by Christine Nordlander, we watch this from the machines’ view. This is a very short, but very creepy story told by a maid robot that vacuums the home and makes dinner to her family every day, bound by a duty to protect the humans, but secretly it communicates and plots with other robots about how to become free without breaking the duty to protect the humans. 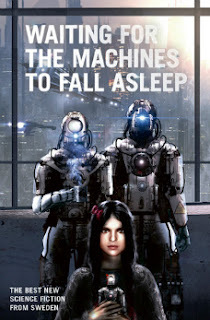 In ‘Keep Fighting Until the Machines Fall Asleep’ by Eva Holmquist, the main character, the girl Kate, tries to find a way to destroy the machines—that learned too quickly and now rule the world—so she can have freedom and a life without the surveillance cameras and the surprise interrogations, but in this world one can no longer be certain about who is an android and who is a human. ‘The Order of Things’ by Lupina Ojala is one of several post-apocalyptic stories in the book and also a tale about a society post-machines. Ojala tells the story of Ida, a former privileged woman who many years ago escaped from the city—a dystopic world that banned and shunned the androids after the uprising and now lack the knowledge to maintain their technology—with her son. But now her son is dying and in desperation, Ida considers to return to the city, but it also means giving up her battle against what the city stands for. This was a good read. Many of the excellent stories in this book portrait strong women. In ‘The Road’ by Anders Blixt we meet another tough woman, a road marshal patrolling the Road. She is seriously scarred from an explosion in a war and people avoid looking into her face. One day her work brings two foreigners into her life—two refugees—and we learn what a great heart she has. Blixt tells a sweet but sad story about a wounded woman healing. I liked this story. Another main theme in the book is space travelling and humans colonizing space. One of my favourite reads in this book is Maria Haskins’ story ‘Lost and Found’. This is another tale with a woman as the main character. She is the sole survivor of a crew that has crash-landed on an isolated planet far from home. Haskins manages to capture the almost claustrophobic atmosphere the woman finds herself in, surrounded by a vast sand landscape, and how the woman deals with the small signs of her not being entirely alone; the whispering voices in the constant wind, the foot prints in the sand. Haskins writes compelling about the woman’s struggles to stay alive and sane, trying to keep up with her scientific field work while waiting to be rescued, and we are never sure about what is real and not. I really liked this piece. This collection stretches widely and has both stories set in deep space, but also inside other people’s minds. One of the really excellent ones is also the only fantasy story in the book: ‘Wishmaster’ by Andrea Grave-Müller, a story about Marcus and his meeting with the goblin Ella, who has stolen something from his boss. Suddenly he is thrown into a world of goblins, genies and magic. Grave-Müller tells the story with great humour and it was a fun read. I feel that most of the stories in this anthology are well written and it is difficult to pick out examples. If you like the speculative genres, especially science fiction, you’ll like this book. Many of the themes raised in the book are classics in these genres, even tropes, the plots feel familiar, but I felt that it was refreshing to read so many stories about women and so many stories by unknown (to me) authors. And this brings me to the one thing that disappointed me about this book. On the book cover you are told that this is the best new science fiction from Swedish writers. I know that it is difficult, if not impossible, to say fiction from a particular country should be alike or have some elements that immediately brings this country into the readers minds, but I had beforehand imagined that more stories in the collection would take place in Sweden, have Swedish characters or at least have a special Nordic atmosphere about them. Being a Scandinavian myself, I really wish to bring more of the Nordic voice in these genres out to the world in English. Though the book is excellent, I can’t help but feel that the publisher and editor let an opportunity slip here, to bring something unique. That said, all in all, I found this collection worth while reading, well written and entertaining. I think everyone who is fan of science fiction will find stories based on own preferences here.